Ramipril is an ACE - angiotensin converting enzyme - inhibitor. Ramipril is used to treat high blood pressure (hypertension) or congestive heart failure, and to improve survival after a heart attack. It also prevents kidney failure caused by high blood pressure and diabetes. ACE is an enzyme responsible for producing the chemical angiotensin II which causes muscles in most arteries, including the arteries of the heart, to contract, thereby narrowing the arteries and elevating blood pressure. 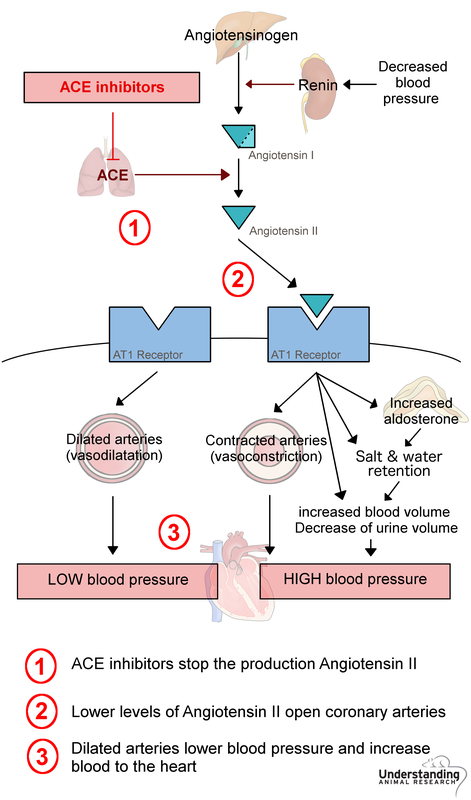 ACE inhibitors such as ramipril lower blood pressure by reducing the production of angiotensin II, thereby relaxing arterial muscle and enlarging arteries. When the blood pressure is lower, the heart does not have to work as hard to pump blood. This increases the flow of blood and oxygen to the heart, further improving the ability of the heart to pump blood. The effects of ACE inhibitors are particularly beneficial to people with congestive heart failure. In the kidneys, ACE inhibitors enlarge and reduce blood pressure in the arteries that supply blood to the kidneys which reduces damage to the kidneys due to high blood pressure. The FDA approved ramipril in 1991.